From panoramic views at Skydeck Chicago to the interactive science exhibits at the Museum of Science and Industry, the Windy City's sight-seeing opportunities are certainly nothing short of spectacular. As you make your way through the numerous unique Chicago attractions , you'll also be making way for a mean appetite. Luckily, you'll probably find yourself running into a familiar aroma specific to the region, a distinct smell of Chicago deep dish pizza that may be hard to escape. It comes as no surprise that Chicago is the deep-dish pizza capital of the world; thick, crunchy crust topped with lava-like cheese oozing from the seams, coupled with your choice of ingredients stuffed into a single pie. Is your mouth watering yet? When every corner pizza joint looks just as delectable as the next and you can't seem to make up your mind, CityPASS has you covered. 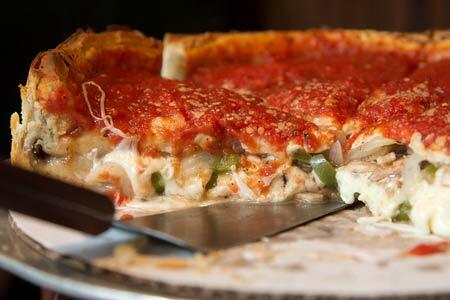 Grab the whole family, because you're going to take a bite out of our top 5 deep dish pizza spots in Chicago. Recently voted the best Chicago deep dish pizza, Chicago residents have pinned Lou Malnati's as the go-to eatery for all things local pie. Legend has it that the majestic waters of Lake Michigan create the perfect mixing component when the dough is made. Whether it's the home-made dough, tastefully satisfying plum tomato sauce, or the rich pizza-making history of the Malnati family, you're not walking out of Lou's without a smile and a stain. Located in the city's Lincoln Park section, Pequod's is a neighborhood favorite that appeals to all ages across the spectrum, from toddlers to local old-timers. Here you will find a fairly different take on conventional deep dish (as if there's really such a thing as "conventional" deep dish). The kicker here is the invariable ring of burnt-to-perfection cheese that surrounds the border of your perfect looking Chicago deep dish pizza. It's the bite you always look forward to, multiplied to serve you ultimate satisfaction. The recipe for this pastry-like pizza dates back decades to the founder's mother, who put together a multi-crusted pie packed with ricotta cheese and an array of meat fillings. This culinary creation became better known to the local village as the Italian Easter Pie. Mama Giordano became an instant staple in her small northern Italian town and eventually introduced the secret recipe to Chicago in 1974. Ever since the release of this magnificent treat, Chicago locals and tourists alike have been coming to Giordano's for stuffed pie and deep dish delicacies. This unique pizzeria located on Ashland Avenue has bridged the gap between calzones and traditional thin-crust pizza, creating a revelation of epic proportions. When you're on the hunt for a pizza slice that places you into a food coma, while encompassing all of the flavors one requests when signing up for carb overload, Art of Pizza is the clear choice. 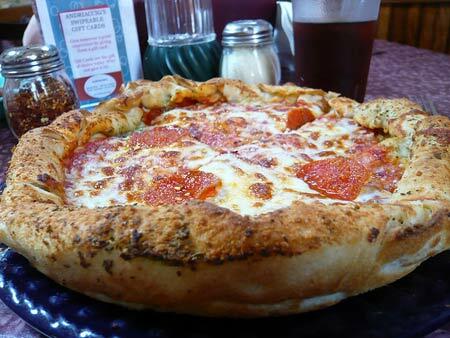 Stuffed pizza with limitless ingredients alongside a crispy exterior creates an almost irresistible situation. Choose your ingredients wisely or you may find yourself crawling home. Topping off our list is a pizza joint with multiple locations sprinkled around the city, known to locals as the premier spot for Chicago deep dish. Gino's East prides itself on their creations, ensuring that every single pie features golden crust, red vine-ripened tomatoes, and the freshest ingredients of your choice. Cranking out mouth-watering deep dish pizzas since 1966, Gino's hasn't changed a thing and continues to deliver their customers top notch pizza in city known for just that.